I am not feeling too happy right now as I have a big abscess in my chin. It started off last Wednesday (four days ago) as an apparently infected hair root. By Thursday an abscess had started to form and it has just gotten bigger and bigger. I had hoped that it would develop a head near the surface that I would be able to open and drain myself. As this hasn’t happened I will be going to the doctor tomorrow so that I can get some antibiotics, and hopefully get the blasted thing drained. This is really getting annoying as I have had several of these large abscesses in the last year or two; with this being the third that is going to need lancing this year. In January I had one on the back of my neck lanced, in February one on the inside of my thigh and now this one on my chin. Both my sons have also had them and while some have presented as spider bites with necrotic tissue rather than a pus-filled abscess, others seem to just be regular abscesses. Fortunately Mela hasn’t had any as she has more than enough medical worries of her own without having this sort of thing. This entry was posted in Thoughts and tagged abscess, bite, chin, hair, infection, insect, necrosis, necrotic, pus, root, spider. Bookmark the permalink. Thanks Em. This one isn’t too bad; not comfortable though. The one on my thigh was very painful but the one on the back of my neck was the worst. At one point I could have happily dug it out with a spoon, if that would just make the hurting stop. Fortunately they start to feel much better as soon as they are opened and the pressure is relieved. I can relate to the annoyingness of the recurringness — I’ve been suffering a coldsore plague since 2000 — it does get frustrating. Sorry to hear your afflictions are so painful. since june of this year, i’ve been dealing with ingrown nosehairs. JUST when i thought things were settled (a la daily neosporin swabbings and occasional warm water compresses on my nose before starting work and during lunch time) i discovered a small pimple on my chin the sunday evening just past. i realized this could be just a zit, or my latest adversary, an ingrown hair. i put a warm water compress on my chin and moved on. later on tuesday i noticed that the pimple had matured, so i decided to try and pop it. BIG MISTAKE. 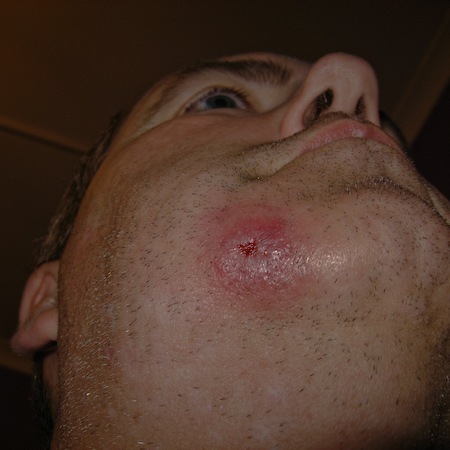 by the next day, my chin began to swell and fill with pus which would erupt from the popped pimple. i used warm water compresses throughout the day, coupled with neosporin, but the pain persisted and i daresay my chin began to swell. 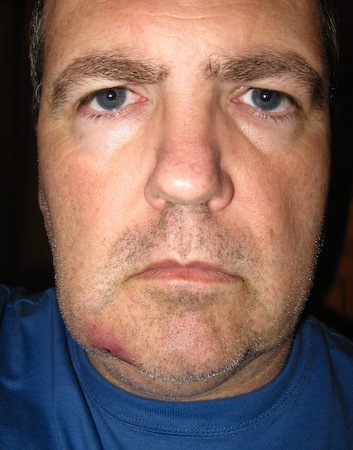 it got really nasty last nite and i went to bed until i was forced to wake up from the throbbing pain in my chin. i discovered a tiny noodle of pus that was making its way onto my goatee. so i cleaned that up and went to bed, and woke up this morning with even more pain and swelling…i ended up having the thing cut at the hospital’s urgent care unit.